I wasn't sure how these were going to turn out, since I haven't bought many plants on Amazon. We decided to give them a try anyway, and they are really taking off! They will supply a garden or natural and will bright, brilliant color. They will have a bloom that will be bluish purple. They can be found growing a lot of bodies of water where the soils are moist. Blue flag iris can grow well in areas around Florida. They can add color to any areas where they can be planted, and they begin to bloom. Blue Flag Iris will usually bloom in the late spring months. They will have a beautiful flower and can sometimes have two to four buds on one stalk. They are amazing when several are in bloom at once and will add a brilliant amount of color. These flowers will give a very natural look to an area. These flowers grow wild in meadows. Blue flag iris prefers moist and sometimes found in swampy areas. They can also grow in shallow water. Blue Flag Iris are a beautiful perennial to add to flower gardens, natural areas and also to outline walkways and driveways. This variety of perennials will come in lots of colors and will even look amazing when the colors are mixed and especially when they are all in bloom. These will typically bloom in the spring and early summer months. These flowers are also not very particular when it comes to soil conditions where they grow. These are very hardy and robust flowers although they look very delicate when they are in bloom. Irises are also great to cut from the stems and will even make a gorgeous bouquet of flowers. One can add a vase to give a unique look to a dining room table. These perennials are great because they will grow back each year after they grow. They are amazing and will grow back thicker every year. They will eventually need to be thinned out and separated, and this will give lots more of them to plant in other areas where bright and brilliant colors are required for a lawn. There are also some fantastic varieties of irises to choose from. Bearded Iris is a great one that will grow in moist soils, and this one will even attract rabbits and small birds to an area. The Blue Flag Iris is another one that produces great in well-drained soil conditions and will add a fantastic color of gorgeous blue. 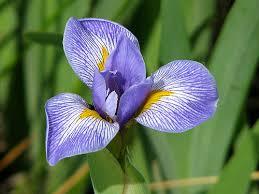 Irises are available in white, yellow, burgundy and also a bluish tint. These perennials will paint a dazzling picture of any garden or lawns where they grow. They are great because they will also be very easy to care for and to maintain. Once they have bloomed and are starting to die out trim the long leaves down to the ground, and they will multiply for the next season. Blue Flag Iris will give a fantastic look where they grow. These plants do great where the soil is moist and can also grow in wet soil conditions. These beautiful flowers will bloom during June. They will make a stunning flower for a garden and water or rain garden.